The 28 December of 2012 the refugees who had marched all the way from the Traiskirchen detention center and had occupied the Sigmund Freud park for over a month, were evicted by the government and all their tents and belonging destroyed. 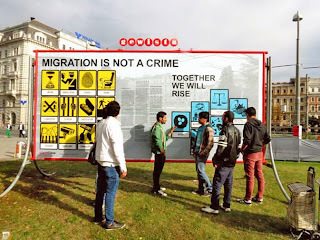 In the frame of Wienwoche, the Re-emphasis project took over a billboard to bring the story of the refugee movement in Vienna in the same place it had started, the Sigmund Freud park. 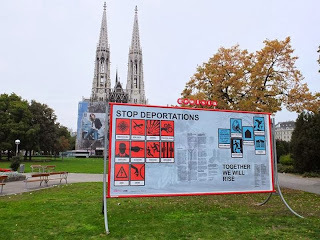 The billboard displays a vocabulary of icons made to denounce and demand, as well as a poem that having been created by the refugees, told the story of their struggle. Re-emphasis also organized a transnational forum for refugee activists from Europe to network closer together, to exchange knowledge and bring their concerns to broader parts of the Austrian public.